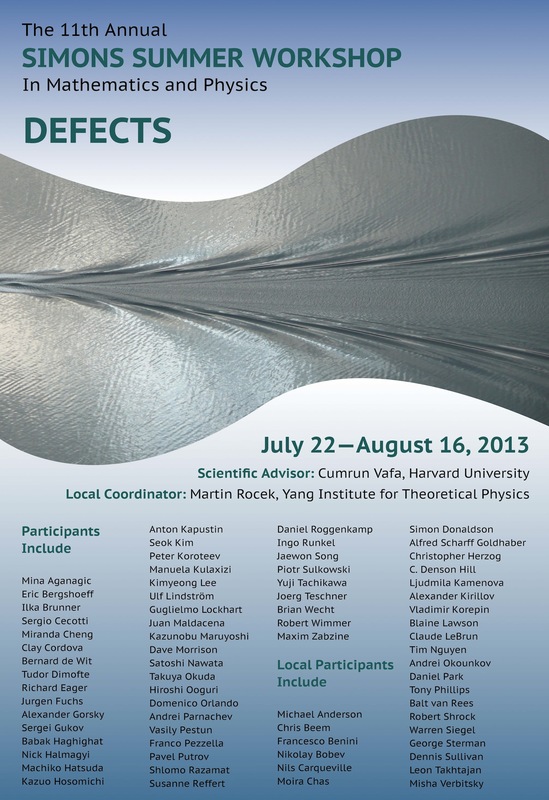 We are pleased to announce the 2013 Summer Simons Workshop in Mathematics and Physics from July 22 to August 16. This workshop is the sixth conducted by the Simons Center for Geometry and Physics at Stony Brook. The Center’s mission is to develop the interaction of geometry in the broadest sense with theoretical physics, and is rooted in a long tradition of engagement between Mathematics and Physics here at Stony Brook, and ultimately in the centuries-long history of these two fields. The Stony Brook tradition is exemplified by the joint ITP-Math seminars initiated by Jim Simons and Frank Yang in the 1970’s; these stimulated interest worldwide in the mathematics of gauge theories. This workshop is also a continuation of ten previous Simons Workshops; like them, it will focus on the intersection between physics and mathematics, particularly in the context of string theory. 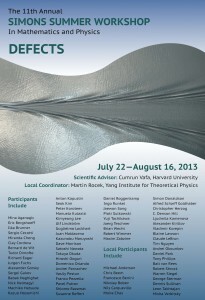 The principal theme of this workshop will be “Defects”, i.e., the study of different dimensional defects in diverse dimensions and diverse QFT and string theories and their inter-relationships. For higher-resolution pictures or for more pictures of any given person, you should contact Martin Rocek at martin.rocek@stonybrook.edu. To view a clip from the party at Martin’s house, click here. As in the previous summer workshops, we hope to facilitate an informal yet vibrant atmosphere, in which a core of leading researchers interact together and with promising junior physicists and mathematicians. The program will be light, with a mix of both pedagogical and research talks.